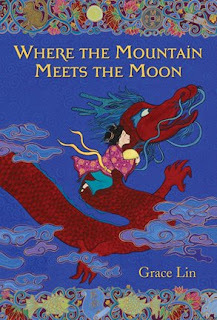 Where the Mountain Meets the Moon is a lovely middle-grade fantasy, set in an ancient China that never (quite) was. It tells of a young girl named Minli, living a frugal life on the slopes of Fruitless Mountain, listening to her father tell wondrous stories of Jade Dragon, the Old Man of the Moon, and the evil Magistrate Tiger, and watching her mother becoming increasingly bitter about their poverty. When Minli exchanges one of her two coins for a goldfish, only to realize that even a fish's mouth is one mouth to many for her family to feed, she sets in motion a journey that will take her deep into the realm of her father's stories. "Oh, Minli!" Ma said impatiently. "Bringing fortune to our house! Making Fruitless Mountain bloom! You're always wishing to do impossible things! Stop believing stories and stop wasting your time." "Stories are not a waste of time," Ba [Minli's father] said. "Stories, " Ma said, slapping her hands against the table, making the water in the fishbowl sway as she stood up and left the table, "are what wasted money on this goldfish." (ARC, p 25). Minli is a believer in stories, and so, when she sets her goldfish free, and it gives her instructions on how to find the Old Man of the Moon on Endless Mountain, she hardly thinks twice before setting out to ask him how her village can prosper. On the way, she befriends one of the nicest fictional dragons I can think of, and with him confronts the horrible Green Tiger created by the wicked Magistrate's desire for revenge. Throughout their travels, they are told stories, and these tales within the larger tale shape the world in which the story is set, giving it depth and magic. Where the Mountain Meets the Moon has not yet been released (it comes out next week), but already it is garnering accolades. Deservedly so, because this is truly a lovely story. There's the adventurous journey part, to provide interesting forward momentum. There's the strong central character, and her dragon companion, to provide an anchor for the reader. Then, and this is what makes the book stand out in my mind, there is the sense of being in a place far removed from the here and now of 21st-century America. This is not just because it is "set in China" and features a non-white heroine, although these aspects of the book make it a welcome addition to middle-grade fantasy. Grace Lin has made her imagined China a very real and rich place, not simply through the inclusion of magical background in the embedded tales, but through her use of imagery and metaphor in her writing, combined with practical details of life, like how to plant and cook rice, and what you would pack if you were a peasant girl in ancient China setting off on a journey. Where the Mountain Meets the Moon has full-page, color illustrations (like the one at left), and although I read an ARC of the book, and so haven't seen them in their final setting, it's fairly clear that they will make the book even more magical. I delighted in those of my old fairy tale books that had full page color illustrations,* so kudos to Little Brown for this. This is a great book for reading out loud--it is episodic not just in the stories within the story, but in terms of Minli's adventures, and so can be put down and picked up again the next night without young listeners feeling disengaged (based on my test of the book on my children). It is also a lovely book for anyone to just curl up with and read (based on my own reading of the book). Me: I think of you primarily as an artist, and I was struck by how easy it was to see the story in my own mind as I read (helped, of course, by the illustrations, which I am very much looking forward to seeing in their final form). Grace: The character of Minli came to me from a painting. But the actual narrative, plot, and setting of “Where the Mountain Meets the Moon” began as words. Even when I work on picture books, the writing or the stories come first. I think that is because in art school we were trained that way, we were given a story or words first and then had to illustrate them—never the reverse, creating an image and then writing a story around that. Perhaps, that is why after all this time I am starting to view myself as an author first, instead of an illustrator. Me: Was the China you created already in your mind, or did you immerse yourself in Chinese stories prior to writing the book? Grace: Both! I had an idea of China-like setting from the books I read from my childhood and the trips to Taiwan and Hong Kong I had taken. But when I decided that this was the story that I wanted to write, I began to research and read as many Chinese folktale and fairy tale books I could get my hands on (some of which I put in the bibliography in my author’s note). Then, I actually visited China. Me: A frivolous question--I liked the talking goldfish very much (I was very fond of my own goldfish, Black Spot, who would eat out of my hand and do tricks). Do you have a fish in you own life? Grace: I used to have a goldfish as a child, which I named “Sushi” (I thought that was hilarious) but it died long ago. I don’t have one now, but I want to in the near future (when I stop traveling so much). I think there is nothing more peaceful than a goldfish in a bowl. And hopefully, it will bring me good fortune too! *Except the really, really scary Hans Christian Anderson book that I wish I had never seen. I tried not to look at those pictures. Thanks so much for hosting me and this great post! So happy you enjoyed the book. Great review; can't wait to pick this up for my daughters! That illustration is gorgeous! I am going to have to find me a copy of this book asap, because it definitely sounds like something I would enjoy. And what a fun little interview! I can't wait to read this book now! I hope you enjoy it! And I'm glad this poor little post got another comment...thank you!